Paperback, 9.75 x 8 in. / 288 pgs / 297 color / 59 bw. Introduction by Brian Sholis. 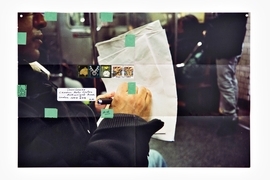 Text by Eric Rosenberg, Moyra Davey. Conversations with Ben Lerner, Élisabeth Lebovici. From early portraits of her five sisters, to photos taken above bookshelves and under beds, and later series on the New York City subway, Moyra Davey has spent four decades developing a practice that comprises photography, film and writing. This book surveys Davey's work, bringing together her photos and film stills, and her writings on photography, memory, art and historical figures, alongside a suite of new essays and interviews. Davey examines the texture of life: defaced currency, empty whiskey bottles, the dust under a record player's needle. She also acknowledges that photos can be mementos, and for some time has printed her images as a kind of correspondence, sending them through the mail; when unfolded, they bear the creases and stamps of transit. Davey's films and essays are characterized by a similar intimacy, evinced by the artist's own peripatetic, literary mind. These are some of the figures that haunt her imagery: Walter Benjamin, Mary Wollstonecraft, Jean Genet and Chantal Ackerman. As with her photographic accumulations of fragments, Davey approaches these touchstones indirectly, drawing from their letters, journals and less celebrated works to understand how they committed to living creative lives. Edited by Karen Kelly, Barbara Schroeder. 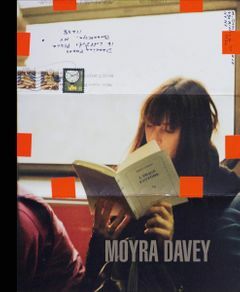 Text by Moyra Davey. Introduction by Aveek Sen. FORMAT: Pbk, 9.75 x 8 in. / 288 pgs / 297 color / 59 b&w. Published by Steidl/Scotiabank Photography Award.